German Flavoured rum was very intense with usually over 1200 units of esters as opposed to traditional rum with an average of around 400 units of esters. 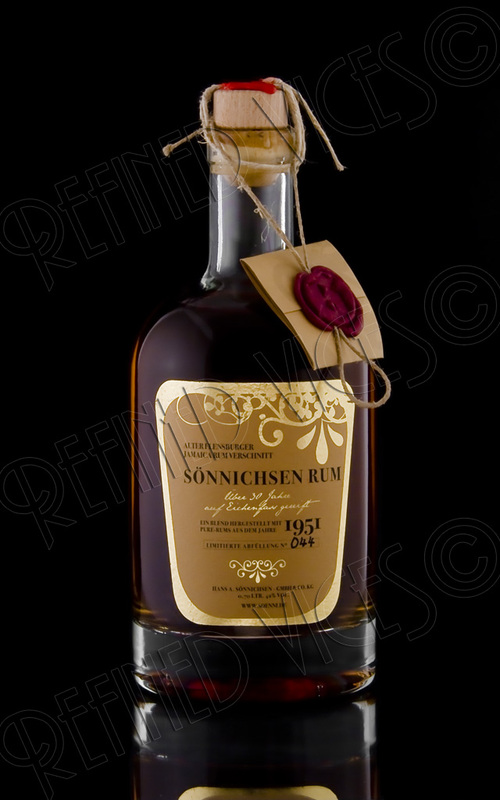 Rum Verschnitt in Germany was made using 5% of this concentrated pure rum and by adding 95% of local spirit called Primasprit (97% abv) and diluted to 44% abv with finest Flensburg water, where Sönnichsen Jamaica Rum Verschnitt 1951 was made. 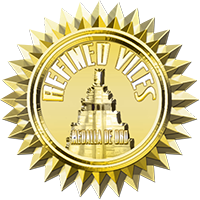 In the late 1950s Rum Verschnitt saw a popularity increase so great, that the producers in Jamaica had to find an efficient way to expand the volume of production, which resulted in rum with lower amount of esters, around half of what it used to be. In 1956, Hans A. Sönnichsen bought 4 carefully selected pure pot still rums at 67% abv, which at the time of the purchase had already spent 5 years in oak casks. 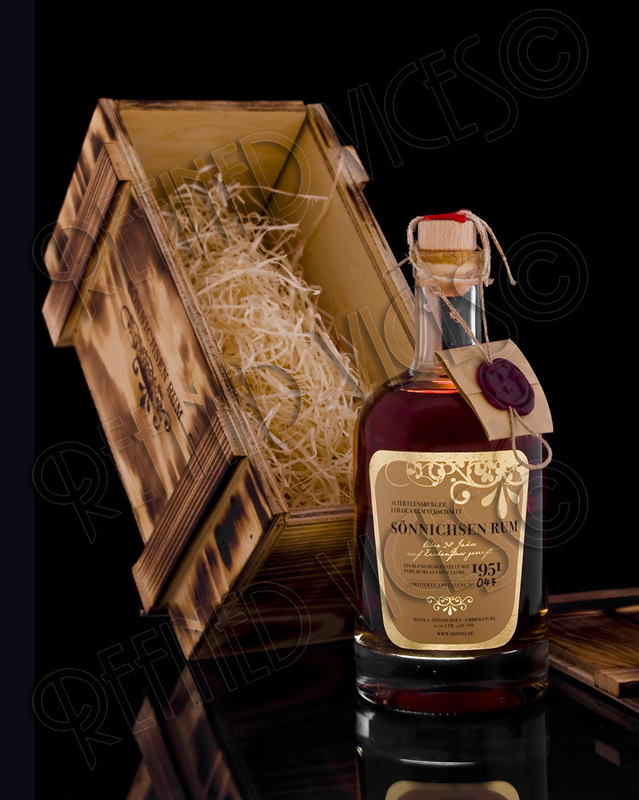 He blended these 4 high ester Jamaican pure rums and put them to rest in the same oak barrels until 1984 when it reached its optimal maturity. 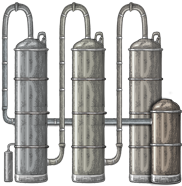 After being pressured through a filter with 20 layers to a stainless steel tank, Sönnichsen Rum has been produced on demand until 2 years ago when the last portion of the 1951 Rum Verschnitt was made in Flensburg. The remaining 7000 bottles of Rum Verschnitt 1951, bottled in memory of Hans A. Sönnichsen who passed away in the year 2000, may be one of the last of its kind. 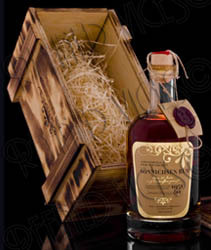 The bottle of Sönnichsen Jamaica Rum Verschnitt 1951 arrived in a rough branded wooden box filled with wood shavings for protection of the bottle. The bottle itself is a thick bottomed one with a plain wooden cork on which a small brochure is attached with a red seal. The brochure itself is sealed with a dark red wax seal. On to the label has been handwritten the bottle number, 044. The colour in the bottle is a beautiful deep amber that resembles glowing coals in a fireplace as you move the bottle in the light. In the glass, however, the liquid is brightly golden and when swirled it first forms thin strands that quickly run down, after which small droplets appear all over the glass occasionally forming a thin strand of liquid here and there. Once the wooden cork was removed an incredibly intense, dark, mysterious fruit aroma wafted out of the bottle nose with softly sweet, creamy caramel aromas. In the glass the aromas of vanilla and fruit are just as intense with the ever so slight woody floral note creeping up from the midst of the heavy aromas that you could almost imagine cutting with scissors. There is also a rather strong presence of alcohol that once puffed out of the glass gives space for a copper and toffee note. In the empty glass there is a strong smell of raisins. The taste comprises of sweet, very warm and rich flavours with some woody bitterness, lots of vanilla and intense dark fruits. It has a bite to it but once you get past that it feels quite smooth. The spirit leaves an oily coating in the palate once swallowed. There is vanilla, intense flavour of preserved prunes, coffee, light and dry bitterness with alcohol. It leaves a dry, dusty and somewhat fruity aftertaste that lasts very long occasionally giving weak hints of banana. Though Rum Verschnitt 1951 only has a 5% pure rum content it does taste like an aged Jamaican rum and has Jamaican character to it, though I think the primaspirt slightly but only slightly pushes through. I am really pleased to have been able to taste this historical and rather unique spirit from Flensburg and must thank the Sönnichsen family for providing a sample to me.